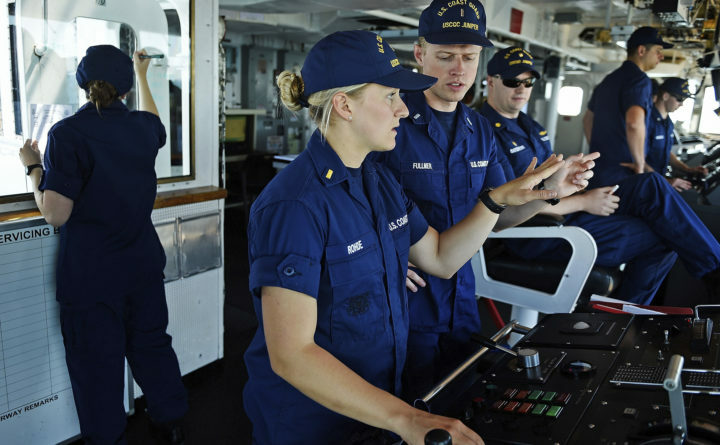 In this Wednesday, Aug. 15, 2018 photo, U.S. Coast Guard ensign Dana Rohde, center, works with Lt. j.g. Austin Fullmer at the controls of the cutter Juniper as Ensign Emily Cox, left, records operational information during Aids to Navigation maintenance on two buoys in the waters of Long Island Sound. The Coast Guard receives funding from the Department of Homeland Security, and is subjected to the shuttering of parts of the government along with DHS’s other agencies. That stands in contrast to other military services, which are part of the Defense Department and have funding. The tip sheet, titled “Managing your finances during a furlough,” applies to the Coast Guard’s 8,500-person civilian work force. About 6,400 of them are on indefinite furlough, while 2,100 are working without pay after being identified as essential workers, said Lt. Cmdr. Scott McBride, a service spokesman. They were last paid for the two-week period ending Dec. 22. The Coast Guard’s status as an unfunded military service increasingly has become a political issue, as family members share their worries about a shutdown with no end in sight amid a political dispute about President Donald Trump’s proposed border wall. Coast Guardsmen rely not only on paychecks, but also now-frozen government housing allowances in order to afford housing in expensive coastal cities where many are assigned. Late last month, the Coast Guard announced that it had found enough money to pay its service members one last time through the end of the year. The Trump administration took credit afterward, releasing a statement that said the president and some of his staff members had worked “round the clock” to address the issue. Coast Guard leaders have sought to provide as much information as possible, and offer suggestions for where financial assistance might be possible. Late last month, it also released a letter for families to provide to creditors while seeking temporary financial relief. Coast Guard family members said Wednesday that there are no easy solutions as the political stalemate continues, but that they are getting by. Natalie Daniels, whose husband is stationed in San Diego, said her family’s situation isn’t “dire just yet,” but missing the upcoming paycheck would definitely “start the clock” on that. Their family includes four children.